Description: As Sherman’s infantry marched southeast through Georgia, his cavalry, under Brig. Gen. Judson Kilpatrick moved northeastward, on November 24, 1864, to destroy the railroad midway between Augusta and Millen, burn the trestle near Briar Creek and, if possible, release Union prisoners confined at Camp Lawton, near Millen, while feigning a drive towards Augusta. 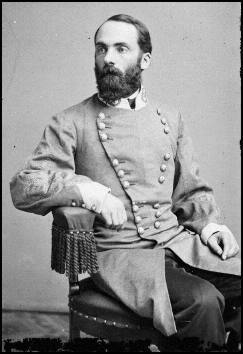 Confederate Maj. Gen. Joseph Wheeler was fooled and concentrated his cavalry forces around Augusta. When Kilpatrick did not show, Wheeler realized his mistake and rode off in an attempt to catch his Union counterpart. On the 26th, Wheeler caught up with two lagging Union regiments, attacked their camp, chased them to the larger force and prevented Kilpatrick from destroying the Briar Creek trestle. Kilpatrick instead destroyed a mile of track in the area and moved southwest to join up with Sherman. Kilpatrick also discovered that the Union prisoners at Camp Lawton had been taken to other unknown sites. He encamped near Buck Head Creek on the night of the 27th. Wheeler came along the next morning, almost captured Kilpatrick, and pursued him and his men to Buck Head Creek. As Kilpatrick’s main force crossed the creek, one regiment, supported by artillery, fought a rearguard action severely punishing Wheeler and then burned the bridge behind them. Wheeler soon crossed and followed, but a Union brigade behind barricades at Reynolds’s Plantation halted the Rebels’ drive, eventually forcing them to retire. 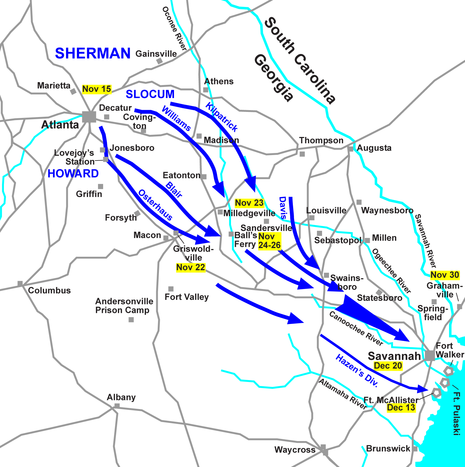 The Battle of Buck Head Creek (also known as Buckhead Creek) was the second battle of Sherman's March to the Sea, fought November 28, 1864, during the American Civil War. Union Army cavalry under Brig. Gen. Judson Kilpatrick repulsed an attack by the small Confederate cavalry corps under Maj. Gen. Joseph Wheeler, but abandoned its attempt to destroy railroads and rescue Union prisoners of war. As Sherman’s infantry marched southeast through Georgia, his cavalry, under Kilpatrick, moved northeastward, on November 24, to destroy the railroad midway between Augusta and Millen, burn the trestle near Briar Creek and, if possible, release Union prisoners confined at Camp Lawton, near Millen, while feigning a drive towards Augusta. Wheeler was fooled and concentrated his cavalry forces around Augusta. When Kilpatrick did not show, Wheeler realized his mistake and rode off in an attempt to catch his Union counterpart. On November 26, Wheeler caught up with two lagging Union regiments, attacked their camp, chased them to the larger force and prevented Kilpatrick from destroying the Briar Creek trestle. Kilpatrick instead destroyed a mile of track in the area. 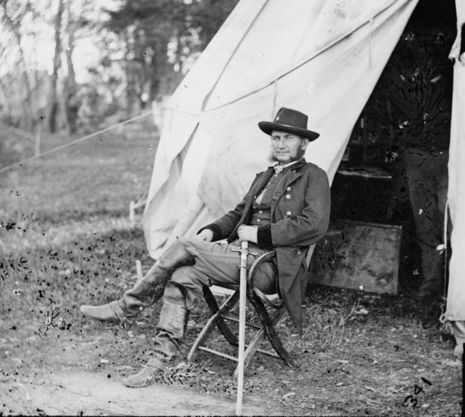 When Kilpatrick discovered that the Union prisoners at Camp Lawton had been taken to other unknown sites, he began to move southwest to join up with Maj. Gen. William T. Sherman's headquarters. Kilpatrick's men encamped near Buck Head Creek on the night of November 27. Wheeler came along the next morning, almost captured Kilpatrick, and pursued him and his men to Buck Head Creek. As Kilpatrick’s main force crossed the creek, the 5th Ohio Cavalry regiment, under Col. Thomas T. Heath, supported by two artillery pieces, fought a rearguard action from behind a barricade of rails, severely punishing Wheeler's troopers with canister fire and then burned the bridge behind them. Wheeler soon crossed and followed, but a Union brigade behind barricades at Reynolds's Plantation halted the Rebels’ drive, eventually forcing them to retire. Kilpatrick rode on to rejoin Sherman at Louisville, Georgia. Union casualties were reported as 46, Confederate estimated to be 600.